“If open is the answer, then what is the question?” was posed by educator and researcher Catherine Cronin (National University of Ireland, Galway) in her keynote address for the Open Education Conference 2016 in Edinburgh, UK last April. This question challenges our community to explore the why behind the how driving open education initiatives, and reveals the need for a body of critical research examining the same. Jamison Miller, Ph.D. student in the School of Education at William & Mary, hopes to develop a framework that balances critical analysis with practical implementations, and provide the open education movement with the foundation to help move it forward in a socially responsible manner. 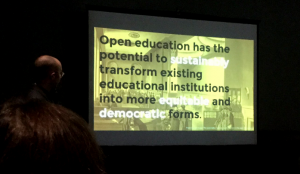 He credits his affiliation with the Global OER Graduate Network (GO-GN) with providing an invaluable support network for doctoral students studying open education. The group helped bring Jamison to Krakow last spring for the OEGlobal Conference, and will be supporting a trip to Cape Town for this year’s conference in March.